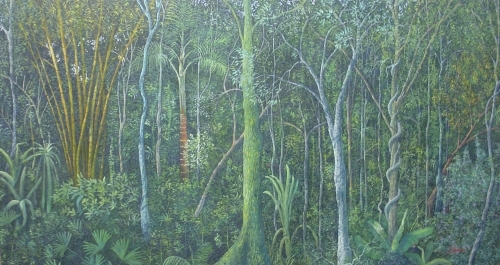 Done is a tight, non-atmospheric magic realistic style, Silfrido Ibara's most impressive canvases feature dense, green proliferations of rain forests. In the stunning "Selva" (meaning "Jungle"), trees are seen just at mid-trunk, almost as if you were a large cat padding through them. The trunks are tightly clustered together, rendered up-close like so many vertical bands of intense verdant green that you are about to enter. The detail is dizzying, as vines coil around trunks and as shrubbery around them all but buzzes with life. Like much art today, there is a subtext here of a planet in very precarious relationship to it's natural habitats. We see in Ibara what we are at this very moment losing and/or wasting (Latin American Masters, Beverly Hills).